Did Psittacosaurus Use Baby Sitters? A team of international researchers have re-examined a set of Psittacosaurus dinosaur fossils that come from the Lujiatun beds of the Yixian Formation in Liaoning, China. The rock slab has preserved the fossilised remains of twenty-four young Psittacosaurs and one older individual. It has been suggested that the fossil represents a group of hatchlings being looked after by an older animal. Could this be evidence of a dinosaur “creche” with a “baby sitter”? The paper on this new research has been published in the academic journal “Cretaceous Research”. The international team included University of Pennsylvania based scientists Brandon P. Hedrick and Peter Dodson as well as researchers from China’s Dalian Museum of Natural History, where the rock slab is currently stored. The fossil material was first described ten years ago, the block, which measures a little over sixty centimetres in length was discovered by an amateur palaeontologist, it is believed to date from around 120 million years ago (Aptian faunal stage of the Cretaceous). Psittacosaurus is one of the most studied of all the dinosaurs. A number of species have been assigned to the genus, it remains the most specious of all the Dinosauria, although some species have been described as nomen dubium following a recent review (2013). Seen as a transitional form between the Ornithopods and the horned dinosaurs, Psittacosaurus is regarded as a basal member of the Marginocephalia. Rarely exceeding two metres in length, fossils of this herbivorous dinosaur have been found in China, Russia and Thailand. Is this evidence of a dinosaur creche with a baby sitter? In order to learn more about how these dinosaurs may have died, the orientation of their bodies was carefully studied. Thin slivers of rock were examined under the microscope and further samples were subjected to X-ray diffraction. The analyses suggested that the matrix was composed of volcanic material, indicating that these prehistoric animals were caught in a flow of material as a result of a volcanic eruption. Since all the fossils were orientated in the same plane, the position of the fossils supports this idea that all these dinosaurs were engulfed in a flow. As the fossilised bones showed no scorch marks or signs of heat damage, the researchers concluded that the flow was unlikely to be pyroclastic in nature. It is likely the flow was some sort of lahar – a mixture of water, mud, rock and other debris associated with volcanic eruptions. Since no egg shell material has been found, it is believed that the twenty-four fossils represent a group of hatched dinosaurs. The larger skull was found in close association with the fossil material, it is likely that this larger Psittacosaurus perished at the same time as the younger animals. All the Psittacosaurs have been assigned to the same species Psittacosaurus lujiatunensis, the skull probably belonged to an immature adult, one not old enough to breed, so the researchers have hypothesised that this was an older sibling helping to care for its younger brothers and sisters. Family members helping out to raise the following year’s brood is a type of behaviour found in a number of bird species. It has been estimated that around 8% of all, extant bird species are involved in some form of co-operative breeding in which other family members help to raise young. This behaviour is found in many types of song bird and the crow family for example. The scientists emphasise that this material cannot be regarded as a dinosaur “nest”. The scientists hope to continue their work by focusing on the micro-structure of the fossilised bones of the smaller dinosaurs to establish whether they were all at the same stage of development. If this is found to be the case, this would support the theory that this rock slab represents the preserved remains of one clutch or brood of animals. The controversial tear-drop shaped Shiva crater located off the western coast of India has divided opinions for decades. Whilst many people may be familiar with the extraterrestrial impact theory that led to the end Cretaceous mass extinction event, most would argue that the Chicxulub crater located off the coast of the Yucatan peninsula (Mexico) is the most likely candidate for that “smoking gun” evidence to indicate that a large body from outer space crashed into the Earth. Not so, according to Professor Sankar Chatterjee and his colleagues. Professor Chatterjee, a Horn Professor of Palaeontology and the Curator at the Museum of Texas Tech University, believes that an object from space perhaps a comet or an asteroid, some forty kilometres in diameter smashed into the Earth around sixty-six million years ago and this too contributed to the Cretaceous-Palaeogene extinction event. The Shiva crater is named after the Hindu god of destruction, transformation and renewal. It is estimated to be around six hundred kilometres in length and around four hundred kilometres across at its widest part. Professor Chatterjee has been awarded the prestigious “Fulbright-Nehru Academic and Professional Excellence Award”, which includes a grant which the Indian-American scholar intends to use to fund a visit to Western India next spring to continue his research on the crater. The Fulbright Programme is an international educational exchange programme sponsored by the Government of the United States with the aim of increasing mutual understanding between the people of America and the rest of the world. Professor Chatterjee will join the Koyna Drilling Project and analyse rock cores drilled through the sea bed in a bid to establish the age of this geological phenomena and to learn more about its formation. Our congratulations to the Professor. The crater was discovered when geophysical surveys of the Mumbai Offshore Basin revealed a huge, tear-drop shaped depression in the strata that forms the western continental shelf of India. The crater is buried under layers of rock which are between two kilometres and seven kilometres deep. Professor Chatterjee explains that the strange shape of the crater may have been caused by the shallow angle of trajectory or by subsequent rock falls or as a result of ancient volcanic activity – after throws of the immense volcanism that led to the formation of the extensive Deccan Traps. The area is believed to hold vast reserves of fossil fuels, both crude oil and natural gas. It is hoped that this new research will confirm that this crater was caused by an extraterrestrial impact, a theory challenged by a number of scientists and academics who contend that this feature does not represent an impact crater at all. The Shiva crater for example, is not recorded on the Earth Impact Database of the Planetary and Space Science Centre at the University of Brunswick (Canada). The estimated location of the Shiva Crater. Last year, Everything Dinosaur reported on some new research carried out by an international team of scientists that dated the Chicxlub crater to 66,038,000 years ago (plus or minus 11,000 years). This was the most accurate date proposed yet and places the impact event at around the time of the extinction event that wiped out the dinosaurs and about seventy percent of all terrestrial life. It has also been suggested that no, one single extraterrestrial impact event was the cause of the extinctions. Indeed, it has been suggested that the dinosaurs, pterosaurs and other groups that perished may have been subjected to more than one Earth/space collision. In addition, Everything Dinosaur reported last year on research that proposed a comet was the most likely culprit for the Yucatan peninsula impact. Everything Dinosaur’s new teaching themed website has been launched today. This new site, aimed at helping teachers, learning support providers and home educators is packed full of dinosaur and fossil themed teaching ideas, blog articles, helpful hints and free downloads. Everything Dinosaur aims to help teachers, museums and home educators. The new website has been designed to act as an educational resource to help teachers, teaching assistants and other member of the teaching profession to cover science subjects aimed at school children from the Early Years Foundation Stage right up to Key Stage 4 and beyond. Home educators too, will find this new resource helpful. Everything Dinosaur’s team of teaching professionals have worked over the last six months or so to provide reliable assistance with the challenges posed by the new curriculum. 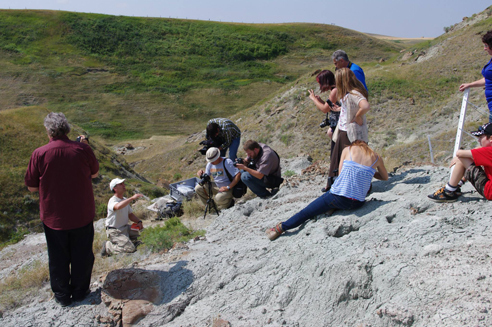 The intention is to help learning support providers and teachers by permitting access to dinosaur, fossil and evolution teaching resources that have been checked over by dinosaur experts and fossil collectors, thus providing a reliable set of resources and guides to assist educators as they instil the skills needed to develop an interest in and perhaps a career in the sciences.